These crocheted leaf patterns will have you dreaming of the crisp, cool days of fall. Both the oak and the maple leaf can easily be completed by a beginner with basic crochet stitch knowledge and experience. Both of these leaves are created with three rounds. Do not let the amount of instruction for each step intimidate you. Each stitch is forming the shape of the leaf. After reading through the steps you may find it helpful to list the order of the stitches and eliminate the words "in next" to assist you in keeping your place. Printable versions of both patterns can be found below the patterns themselves. Picot = ch 3, sl st to 1st ch. 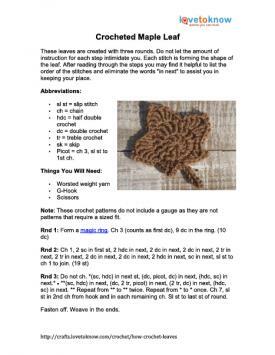 Note: These crochet patterns do not include a gauge as they are not patterns that require a sized fit. Rnd 3: Do not ch. *(sc, hdc) in next st, (dc, picot, dc) in next, (hdc, sc) in next. * - **(sc, hdc) in next, (dc, 2 tr, picot) in next, (2 tr, dc) in next, (hdc, sc) in next. ** Repeat from ** to ** twice. Repeat from * to * once. Ch 7, sl st in 2nd ch from hook and in each remaining ch. Sl st to last st of round. Note: This leaf starts with a row, changing to a round with Rnd 2. Rnd 2 has also been split into two sections. Row 1: Ch 17. Dc in 3rd ch from hook and in next 3 chs, hdc in next 4 chs, sc in next 6 chs. Rnd 2 (first side): Ch 1, turn. Sl st in first st, sc in next, hdc in next, (dc, ch2, sl st) in next, sl st in next, sc in next, hdc in next, dc in next, (tr, ch 3, sl st) in next, sc in next, hdc in next, dc in next, (tr, ch 3, sl st) in next, sl st in next, ch 3, 3 dc in 1st ch sp of previous row. Rnd 2 (second side): dc in next, sl st in next , (sl st, ch 3, tr) in next, dc in next, hdc in next, sc in next, (sl st, ch 3, tr) in next, dc in next, hdc in next, sc in next, sl st in next, (sl st, ch 2, dc) in next, hdc in next, sc in next, sl st in next. Ch 6 (stem). Rnd 3: Sl st in 2nd ch from hook and in the remaining chs of the stem. Sc in 1st st of the leaf. Sc in each st around and 2 sc in each ch space. Sl st in last st before stem. If you'd like to take your patterns on the go, you can download and print both of these leaf patterns. Just click on the pattern you wish to download to open the printable PDF file. Download the maple leaf pattern. Download the oak leaf pattern. Tie leaves to twine for a lovely mantel garland. Greet your guests with a wreath filled with crocheted leaves in vibrant autumn hues. Customize existing fall decorations with crocheted oak and maple leaves tucked here and there. Experiment with different crochet hook sizes and your basket of scrap yarn bits to create different sizes and colors of leaves. KawaiiBlythe has a cute little leaf pattern that would be a fabulous addition to a flower, wreath or garland. This pattern is quick and easy. For teeny weeny projects, try this adorable little leaf on Fiber Flux. Make several of these leaves to have on hand for an added touch to small flowers. This simple pattern is perfect for a beginner. Try the fern leaf on Attic 24 for a bit more versatility in a crocheted flower arrangement. While the image looks like the pattern would be complicated, it is not. 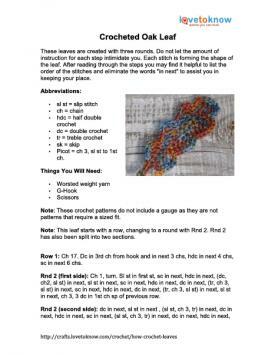 The most basic of crochet stitches were used, making this project quite simple for someone new to crochet. Small crochet patterns like these leaves are fantastic take-along projects. Pack a tote with your yarn, hook and the patterns, then take them with you while sitting on the sidelines of your kids' sporting events.